That I Made When Learning Vegetable Carving. So, I went looking online. I found a few books that looked interesting. But, being online, I was not able to leaf through them to see what kinds of vegetable carvings were being taught. The covers looked good and the reviews were OK to very good. I ordered several. I was excited when I received them. But, as I examined them more closely, I was disappointed. One of the vegetable carving books that had a cool cover, was filled with really childish vegetable figures of people and penguins. I found it much too childish for what I was hoping for. Two of the projects were so simple and well, lame. One of them gave instructions to take a lemon, add cloves for eyes and you have the face of a bear. Honestly?! This was NOT was I was looking for. I wanted some elegant carvings that I would be proud to use for centerpieces. These were something I might only use for a preschoolers birthday party. The cover was about the only part of the book that I liked. What a waste of money! The next book did have elegant and beautiful fruit and vegetable carvings. I thought, this is going to be good! But, as I began to read, I was disappointed again. Many of the first pages talked about a whole bunch of different fruit and vegetable carving tools. Then, all the carvings in the book required this whole collection of tools. As beautiful as this book was, it seemed to be a promotion book for the manufacturer of the tools. OK. I was still anxious to learn fruit and vegetable carving. So, I went looking for the tools in stores. I tried large retail home and kitchen stores, I searched a slew of kitchen gadget and specialty cooking stores and could find nothing. I went online and searched specifically for those tools and that brand. I finally was able to locate a couple of the tools (and they were quite expensive) but still could not find where to buy most of them. I found the manufacturer in Europe and an America distributor but they did not sell directly to consumers. By now I was quite frustrated. This book was not cheap and still did not deliver as I had hoped. In the process I also spent a bunch of money on tools an knives that I found online that seemed fun. Some were an absolute waste of money but that is another whole story. 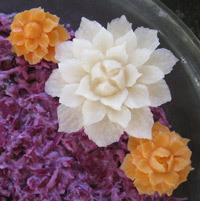 Yam and Turnip Flowers are taught in the Vegetable and Fruit Carving 101 course. Beet Roses are taught in the Hearts and Roses lessons. The third book turned out to be the best choice with instructions on how to do a variety of carvings with only a few tools. However, because it was written by a Thai woman, many of the carvings described in the book were done with fruits and vegetables common in Thailand that I have never seen or heard of and was not even sure could be found in grocery stores in the United States. There were vegetable carvings made with sopadillos, green rose apples, jujubes, taro, little yellow eggplants, and elongated Sawoei eggplants. Even though I have since become acquainted with some of these fruits and vegetables, they were foreign to me. At least there were some vegetables in this book that I recognized and so I got to work. Then what I realized is that photos and words in a book don’t really convey vegetable carving instructions very well. Some things I could figured out but the instructions for the many of the complicated fruit and vegetable creations were just incomprehensible to me. 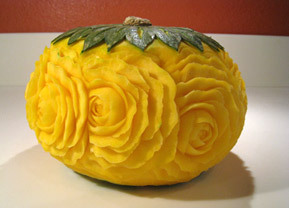 Kabocha Squash Carved with Roses – rose carving pattern taught in the “Carving Roses – Watermelons, Buds and Leaves” video lessons. I really wanted someone to show me how to do vegetable carving. Within about six months of my book search, I was able to find a live teacher. Actually 2. And I learned a lot from the teacher’s assistant who is also trained in the Thai style of carving. All three are Thai ladies with plenty of fruit and vegetable carving experience. My main teacher was taught by Burinpat Choowong who is one of the more renown carving instructors in Thailand who has published Thai carving books. Later, I was honored to be given one of her books that is no longer in print as a prize at a carving competition. I found it so much easier to learn vegetable carving once I was shown how. I watched as my teacher demonstrated and then did what I had been shown. What a difference! When you are shown how to do vegetable carving, it makes so much more sense than trying to learn from photos and words in a book! I know that carving classes are not available everywhere. And good teachers can be hard to find. That is why I began offering video lessons online. I wanted to make it easy for people like me who want to learn to carve vegetables. I show you how. If a picture is worth a thousand words, than a video with voice is worth 1 million words. 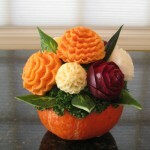 It is so much easier to learn vegetable carving by being shown and that is what I do in my lessons. And that is so true. 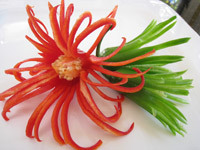 If you have an interest in learning fruit and vegetable carving and are shown how, you will see that it can be easy and not nearly as difficult as you might think. After I learned vegetable carving from being shown how and by doing what I was shown, I later discovered that all my books became so much more useful. Well not all of them. One was still too childish. When I looked at the carvings in the book that was selling lots of tools, I realized that I now knew how to get most of those results without needing a whole bunch of specialized tools. Just a few essential tools are all that is needed. When I looked at the carving book that had the incomprehensible instructions, it all makes sense now. So if you want to learn vegetable carving you may want to learn more about my Vegetable and Fruit Carving 101 Course for Beginners. With it, you will be having fun and impressing your guests with your amazing carvings in no time. Here is a quick mini-lesson that you might enjoy showing how to make a tomato rose. 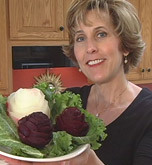 If you’d like to see a free full vegetable carving lesson, simply sign in below. You’ll get instant access to your online video lesson right away. Fruit and Vegetable Carving 101 Course for Beginners.